Mid bloomer. Three yellow tubular sacs with red-purple spots, white tips. Not a true clover, grows in masses, grassy areas. Notes: Figwort (Snapdragon) family. Botanists moved it (and Butter and Eggs) out of the Orthocarpus genus, the common name remains ‘owl’s clover.’ (It is still listed Orthocarpus in Peterson. USDA lists many species for genus Orthocarpus, and also for genus Castilleja, but as yet has no record for species Castilleja lineariloba.) 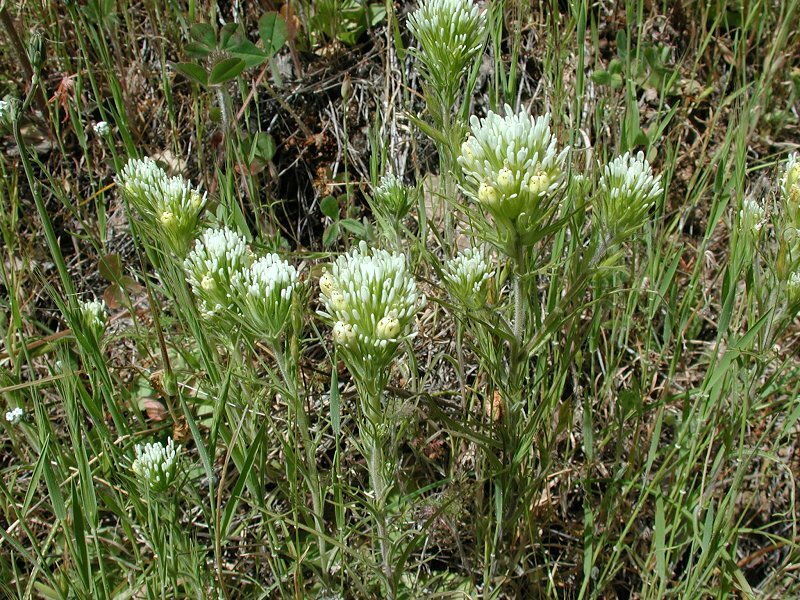 It is therefore not a true clover, but related to Indian Paintbrush. This species. was so-named because some thought they saw an “owl’s face” in the yellow corolla sacs. The species was found at Calflora under the above name at link. The alternate name, Orthocarpus linearilobus, given at this link was also not found at USDA Plants.